Henry Kippin writes for URBACT on why demand management will become fundamental to the sustainability of cities. Collaborate and the Leadership Centre are today launching a delivery-focussed manual for managing demand. This follows on from major Collaborate research in 2014, that explored the potential of demand management to address unprecedented social and economic challenges within a tough climate of fiscal constraints. This new publication offers a practical guide to collaboration readiness, drawn from our practice across the UK and beyond. We believe there's no transformation without collaboration and no collaboration without readiness: this report helps you to take a step back and consider six different aspects of collaboration and provides a shallow route into building readiness in each. We need to shift from a focus on supply-side improvement to one on demand-side change. Henry Kippin offers five ground rules for a more collaborative approach to public services. 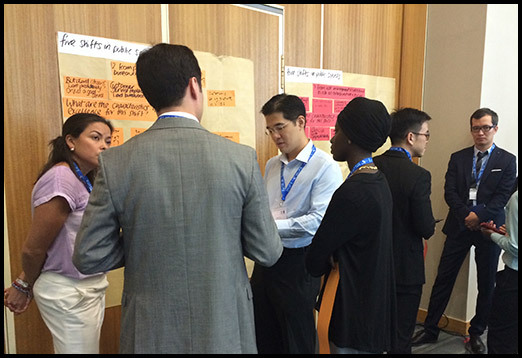 In May 2015 Henry and Sarah were invited to Singapore where the UNDP Global Centre for Public Service Excellence (GCPSE) is based to facilitate a shared space event on the future of public service work. As provocation for this event, Collaborate developed 5 shifts in public service that they believe will be needed for the future of work (in the public service landscape) to be a successful one. Read more about those shifts. This discussion paper reflects primarily on the public service reform agenda in the UK, drawing lessons from a range of British examples to form the basis of a delivery framework that can be discussed, adapted and applied internationally. Collaborate launches a report with the Coalition for Care and Support Providers in Scotland (CCPS), which examines the question of how to shift relationships between commissioners and providers into the territory of real collaboration.